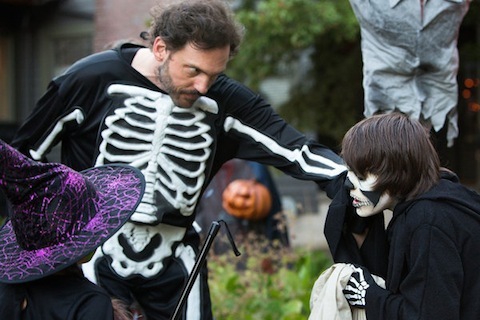 NBC's Grimm is one of those series that has a bit of Halloween spirit built into every episode, but even this supernatural series needs to acknowledged the annual spooky-themed holiday. Check out this clip from the episode to hear Monroe's thoughts on Halloween. And we also have a couple of photos from the episode, one of which shows us what Nick is up against this week. "Back in the good old days…"
That may cause Nick to raise an eyebrow. Something tells me their ideas of "the good old days" would differ. But Monroe seems to have less violent ideas in mind for this Halloween. Check out his costume in this photo below. And for something more along the lines of the episodes monster-of-the-week, this one gives us a look at Angela Alvarado Rosa as "The Woman" or "La Llorona," a ghost of a woman who drowned herself and her children and now haunts the living. Read more about this Friday night's episode of Grimm ("La Llorana") here. Grimm airs Fridays at 9:00 p.m. ET on NBC.